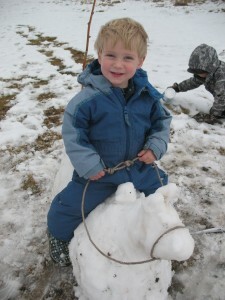 A snow horse is always well behaved! Holidays are here! Lights twinkle along Main Streets in our tiny towns; beautiful snow blankets mountains, valleys and canyons; and the Wallowa County spirit of caring shines brightly. The gifts of community are many, whether time given as a volunteer, gifts of goods or money, or the gift of a hug and smile. All are welcome and worthwhile. If you are in the spirit of giving this year and want to be part of giving something lasting that will benefit future generations in Wallowa County, please join me in making a gift to the Wallowa Fund. Donations of all sizes are welcome and appreciated (and can be tax deductible).